Delighted mum Jane Blagg said her excited boys Isaac, five, and Jude, three, loved seeing their new Bellway house grow as if by magic. 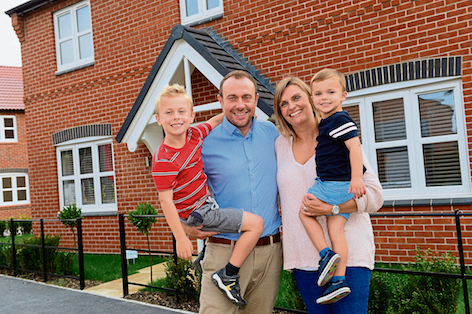 Along with husband Richard, a council commercial manager, the family moved to a four-bedroom detached home at the Bellway Farnsfield development, from a three-bedroom semi. The family used Bellway's Part Exchange scheme to purchase their new home. Jane said: "Isaac and Jude have been very excited seeing the house being built and coming together after starting out as just a field." "We'd set our sights on more room and our new home is just fantastic. Our living space downstairs is amazing and we've got a proper playroom now for all the kids' toys. We've also taken advantage of the company's Part Exchange scheme. That meant we could stay in our old home until we were ready to go and that was a huge plus for us." Bellway's Part Exchange scheme allows purchasers to buy and sell in one easy move. Bellway provides a fair offer for the purchaser's old home based upon an independent valuation and there are no estate agent fees or advertising fees to pay – creating a stress-free move for all. Jane said that both she and husband Richard were 'very impressed' with the build quality of their home as well as Bellway's staff and support. She said: "We'd have no hesitation in recommending Bellway to family and friends. We've settled in just fine and we're all looking forward to making this our home for many years to come." Move into your dream home by calling 01636 680290.